EASTER FRIDAY DINNER 2019 – LeSi Singing Waiter Restaurant, Casa Toscana Pretoria, on Friday 19 April 2019, at seven o’clock. 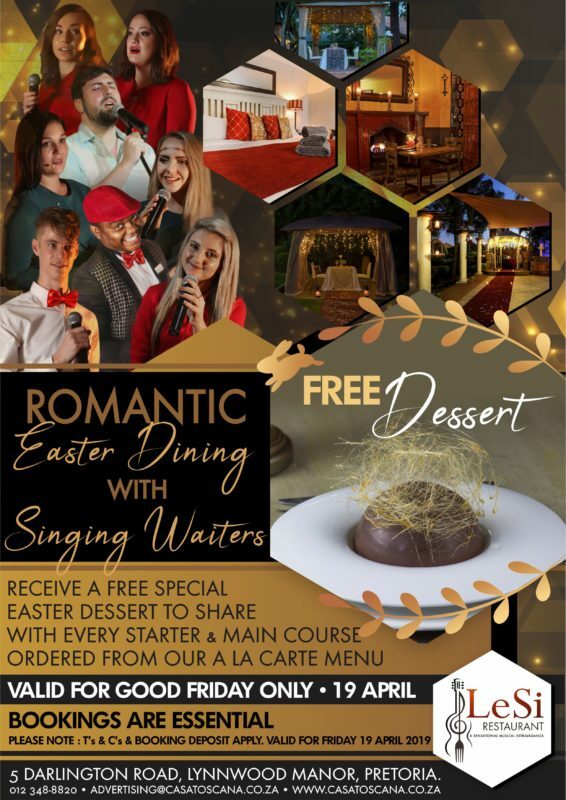 Romantic Easter Dining with Singing Waiters, and receive a FREE Special Easter Couples Dessert to share with every Starter and Main Course ordered from the A la Carte Menu. Bookings are Essential! LeSi Singing Waiter Restaurant offers a uniquely intimate and romantic ambiance, supported by a diverse selection of enchanting meals offered in our a la carte menu and a multiple award winning wine list. The Restaurant is open to the public, seven days per week from 06:00 – 23:00. Receive a free special Easter Dessert to share with every Starter and Main Course. Order from the A La Carte Menu. Valid for Good Friday only.